The Chateau Impney Hillclimb 2016 preview – the popular event returns to Droitwich on the 9th and 10th July, with over 200 pre-1967 cars taking to the track. Here are a few of the cars you won’t want to miss. Last year the event made a return to the historic motorsport calendar, after nearly 50 years absence, attracting over 10,000 visitors. The event Takes place in the parkland of the Chateau Impney hotel in Droitwich this weekend (9th and 10th July), with 200 pre-1967 cars racing against the clock. If you’re heading to Droitwich this weekend, these are the cars to look out for at Chateau Impney Hillclimb 2016. First up is this recreation of J.G. Parry-Thomas’ record-breaking Leyland-Thomas that took almost quarter of a century to complete and makes its competition debut at the Chateau Impney Hill Climb this weekend. The story starts in 1917, Parry-Thomas was chief engineer at Leyland Motors and was tasked with creating a car that could compete with Rolls Royce. His answer, the Leyland Eight, was the first British car with a straight-eight engine. Although highly praised by the press, the Leyland was £400 more expensive than its Rolls Royce competitor and only 18 cars were manufactured. Parry-Thomas left Leyland in 1922 (on good terms), moving to Brooklands race circuit, where he started developing competition cars, which is where the Leyland-Thomas comes in. Using many parts from the Leyland Eight, the Leyland-Thomas proved more successful on track and went on to break several world speed records, including the standing quarter-mile and the running quarter. Both Leyland-Thomas cars were lost during the Second World War, it has been a mammoth challenge for owner David Haywood to recreate the car as faithfully as possible to the original and get it working. The project started in 1992 after David acquired the 7.3-litre engine, which was still mounted in a frame that included part of the car’s chassis and original ID number. With the extensive help of the Leyland Society, David discovered that the engine was the first racing engine developed by J.G. Parry-Thomas. Over the years since, despite having acquired the original chassis drawings, hundreds of photographs of the car in period and as many original parts as he could, he couldn’t restore the car in its entirety using what was available and had to fabricate a large number of parts from scratch. This includes the body, which is a faithful recreation of the streamlined 1924 track body Parry-Thomas broke the Outer Circuit record at Brooklands with. Since the epic 25-year rebuild, David has been keen to put it to the test, and has visited a number of venues and circuits linked to the original Leyland-Thomas, including the Kop Hill Climb, where Parry-Thomas competed in 1924 and the legendary Linas-Montlhéry circuit in France that the Leyland-Thomas opened in 1924. The Chateau Impney Hill Climb will be the car’s first competitive outing, as well as David’s first time competing. Visitors will also be able to see the car up close in the paddock. “It’s a pleasure to welcome such an impressive project to the Hill Climb, and an honour to be the car’s first competitive event” said Rod Spollon, event director of the Chateau Impney Hill Climb, “David’s perseverance is an inspiration to anyone who’s attempted a classic car build, and the Leyland-Thomas will no doubt be a firm favourite in the paddock this year“. No one will has seen a Leyland-Thomas competing in anger for over 75 years, don’t miss it! The 1905 Whistling Billy Steam car didn’t only take eight (painstaking) years to recreate, but a 100 year old law had to be changed so the car could make its competition debut at the 2016 Chateau Impney Hill Climb this weekend. Arguably the most famous steam car ever produced. ‘Whistling Billy’ was one of the fastest of any type of car on the American dirt track races in the early 20th century, before being all but destroyed in a crash in 1912 and left to rust on an American farm. Whistling Billy was originally built by the White Sewing Machine Company in 1905 specifically to go racing. Originally known as the ‘White Rocket’, the car was lovingly renamed ‘Whistling Billy’ by the racing fans due to the howling noise that from its burners on the straights. It won numerous races in its early years and in 1905, it shaved nearly 4 seconds off the world track record for the mile on a dirt round track with a time of 48.45 seconds. There were a string of near misses but in 1912 during a practice run in Portland, Oregon, the car crashed heavily in testing. The impact of the crash broke Whistling Billy in half, the driver, Chris Dundee, survived but was seriously injured. Following the crash, the car ended up in storage before being moved onto a farm, with the engine being put into a boat. 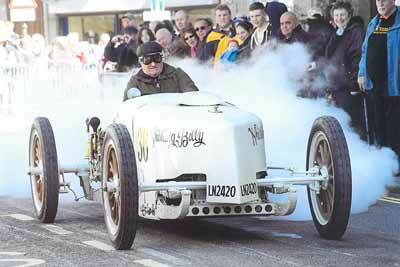 Whistling Billy has been something of a legend in steam car circles ever since. In 2004 current owner, Bob Dyke, began the long journey rebuilding it. Bob has been passionate about steam cars all his life, inspired by his father who owned a number of steam traction engines and steam cars. Bob bought his first White steam car in 1987, and owns a number of other White steamers. The project was completed in 2012, and Bob has since demonstrated the car at venues such as Prescott Speed Hill Climb and Castle Combe. However, until September 2015, the MSA banned steam cars from taking part in any competitive motorsport – and it’s largely thanks to Bob and other members of the Steam Car Club that the ban was lifted. The Whistling Billy’s current top speed stands at 70mph, but according to Bob, there is a lot more throttle to open yet. Bob is confident that the car will perform well on the Chateau Impney hill climb tarmac, despite the fact it’s 14 foot long! Last year, the Edwardian and Veteran class was one of the most popular among spectators and competitors and the Whistling Billy will be one of the most anticipated cars on track this weekend. 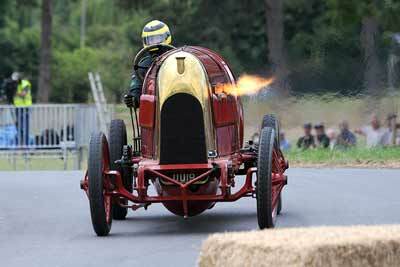 The Fiat S76, better known as the Beast of Turin, will return to the Chateau Impney Hill Climb, having made its first competition run in over 100 years at last year’s inaugural Chateau Impney event in front of over 10,000 people. 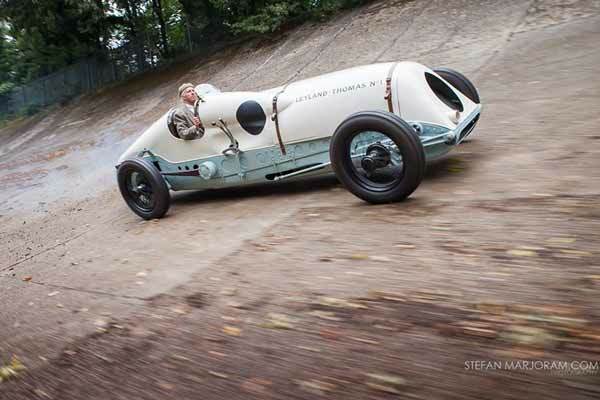 One of the most impressive pre-World War I racing cars ever built, the Fiat S76 was painstakingly researched and restored to its former glory over the last decade by Bristol-based Duncan Pittaway and a team of enthusiasts. Only two S76s were built by Fiat over the winter of 1910 and 1911 and the restored car is an amalgamation of them both. The rolling chassis originates from the earlier car, which set a new world flying mile record of 116mph at Saltburn Sands, Yorkshire in 1911, while the engine comes from the second car, the rest of which was scrapped by Fiat after the First World War. Both cars would have been completely lost had Pittaway not tracked down the chassis from No1 in 2002, bringing them back to the UK from Australia in 2002. That was just the start as the decade-long restoration involved meticulously recreating the gearbox, body and radiator, by carefully referencing original Fiat drawings and period photographs. Once completed, the Beast made a demonstration appearance at the Goodwood Festival of Speed before heading to Chateau Impney to take on its first competition challenge. Competing as part of the popular Edwardian and Veteran Cars class, the Beast of Turin is starring alongside the likes of the De Dietrich, Darracq and Whistling Billy steam car. If you haven’t seen the flames spitting and the roar of the Beast’s 28-litre engine, this is a car not to miss at Chateau Impney in 2016. The event is a celebration of the Hagley & District Light Car Club speed trials that took place at Chateau Impney in the 1950s and 1960s. Taking place on 9th and 10th July, 200 pre-1967 cars race against the clock to claim victory on the exciting 885-metre course. As well as motorsport, the event will also includes a Concours d’Elegance, spectacular air displays and a major classic car auction hosted by H&H Classics.